You will want to find the best Florida Keys motorcycle accident lawyer if you were seriously injured in a motorcycle accident anywhere in the Florida Keys. If you lost a loved one who was killed in a Florida Keys motorcycle accident, the you will want the best Florida Keys wrongful death attorney to represent you and your family. At the Wolfson Law Firm, our Florida Keys personal injury lawyers have helped motorcycle accident victims in South Florida and the Florida Keys since 1963. Our bilingual attorneys have assisted injured victims and survivors get the justice they deserve. All personal injury and wrongful death cases are handled on a contingency basis meaning there are no fees unless we make a recovery for you. All of our consultations are free and confidential. Call us today at (305) 285-1115 and let us answer your questions. The Florida Keys are a favorite for many motorcycle enthusiasts. The Overseas Highway provides a unique adventure unmatched in the United States. The Seven Mile Bridge allows motorcyclists a view that can be breathtaking. Key West, Marathon, Islamorada, Key Largo and all of the Keys in between all market and cater to the motorcycle crowd. As with all things good, sometimes bad things happen. Motorcycle accidents can be some of the worst accidents Florida Keys personal injury lawyers will ever see. Car accidents are one thing but in motorcycle accidents the motorcyclist (and passenger) are exposed to the impact and the environment. This is what makes motorcycle accidents so dangerous and potentially tragic. The Florida Keys motorcycle accident lawyers at the Wolfson Law Firm have more than 75 years of collective experience helping those injured or killed in motorcycle accidents throughout Florida. We have seen the devastating effects of a motorcycle accident. 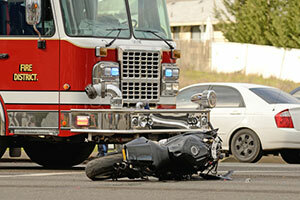 We understand just how life altering a single motorcycle accident can be. If you have questions about a motorcycle accident in the Florida Keys, we invite you to call us at (305) 285-1115 for your free consultation. At the Wolfson Law Firm, our Florida Keys personal injury attorneys serve the great communities and towns of the Florida Keys including Layton, Key West, Bahia Honda, Stock Island, Key Largo, Sugarloaf Key, North Key Largo, Upper Matecumbe Key, Upper Keys, Flamingo, Middle Keys, Duck Key, Lower Keys, Big Pine Key, Key Colony Beach, Big Coppitt Key, Homestead, Plantation Key, Florida City, Tavernier and Islamorada.